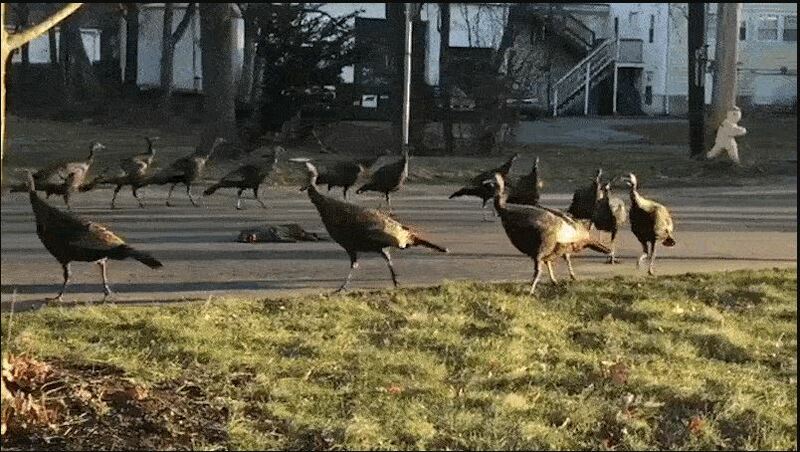 I recently came across a gif file showing a gang of turkeys circling what appears to be a dead cat. It appears to be a structured formation as the turkeys are trotting at the same pace and spacing between each bird. Is this behavior common in turkeys? Is there any explanation for the behavior? It looks like a combination of checking out a potential predator and following a leader. Turkeys, he says, are naturally fearful of cats, which can be a threat to younger, smaller birds. So it’s likely that, when they came across a dead one in the road, they were very curious to see what was going on, and whether it was alive. At the same time, turkeys tend to follow a leader or two as they roam through suburban yards in search of food (they have a diet mostly of nuts, grains, and berries—no cats). So if one leader took it upon itself to march around the corpse and inspect it, it makes sense that the others would follow its lead, while keeping a safe distance from the fallen feline. Hence, a near perfect circle. However, it is not considered normal behavior for turkeys. That said, Scarpitti says he has never seen footage like this in his more than 15 years as a wildlife biologist. He showed it to some of his colleagues at the Massachusetts Division of Fisheries & Wildlife, he says, and they’ve never seen anything like it either. Why exactly are these turkeys circling a dead cat? This is not normal behavior for turkeys to say the least, but it does give one the idea that there is strength in numbers. I once recall seeing chickens circling a large snake and the snake decided to leave the area. They might be performing what’s called a “predator inspection,” says Alan Krakauer, a biologist at the University of California, Davis, who studies the behavioral ecology of birds, in an email to The Verge. Sometimes, animals lower down in the food chain approach predators — a behavior that can be seen as risky, but can actually help the prey. Making the predator aware that the prey know it’s there can sometimes scare the predator away. The “inspection” also allows the prey to check how determined the predator is to attack, and can alert other animals to the danger. What’s weird is that in the video the turkeys are circling a dead cat — definitely not a dangerous predator. And turkeys don’t usually eat dead animals, including dead cats, so it’s not like they’re doing some weird ritual dance before tasting their meal. What could be happening is that the turkeys are stuck in some kind of never-ending circle, with each bird following the tail in front of it. “It’s not unusual for them to get into those dances where they chase each other around,” Scott Gardner, a turkey expert with the California Department of Fish and Wildlife, tells The Verge. Why exactly are these turkeys circling a dead cat? Not the answer you're looking for? Browse other questions tagged animal-behaviour turkeys or ask your own question. What animal might uproot and relocate a newly-transplanted sedum? Will a Rocky Mountain Goat attack a person? How/why do moths appear to not move for days? Do squirrels have front and full peripheral vision? Do Eastern grey squirrels pretend to bury nuts in the ground?